Where and how do I go about hiding the posts that match any of the tags on my ignored list? Click on the Edit Profile & Settings tab. Click on the Preferences sub tab. 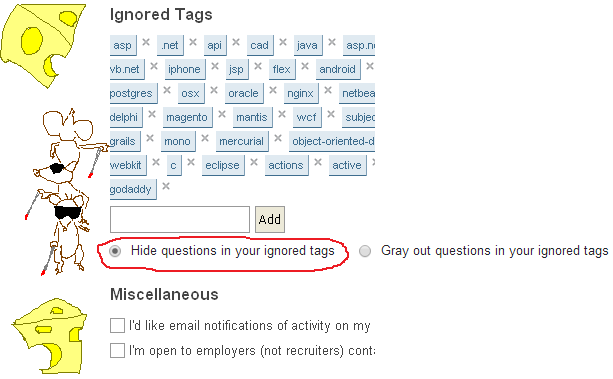 Underneath the Ignored Tags section are two radio buttons, labelled: "Hide questions in your ignored tags" and "Gray out questions in your ignored tags". Check the "Hide questions in your ignored tags" and then go about your business. It will autosave the preference once you check/uncheck. Now, when you're viewing a list of questions, those marked with any of your ignored tags will be removed from view. They're taken out of your view when they get to your side of things, so keep that in mind when paging through with set amounts per page listings. i.e. if you're thumbing through 50 a page, but you only count 40 on the page at a time, then 10 are being hidden. Since the other answer was posted, the user interface has changed. Currently you can no longer change this in your preferences (on the profile page). However, you can change this after you click on "edit" next to the list of ignored tags. 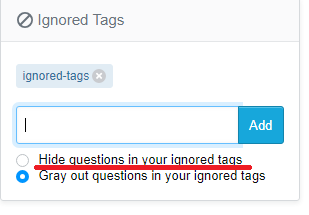 After that, you choose on of two options: "Hide questions in your ignored tags" and "Gray out questions in your ignored tags". When will I not see questions tagged as ignored anymore? How do I remove my ignored tags questions from my Stack Overflow homepage? Is there a way to prevent questions with a specific tag form showing up?